To start with the obvious, this training and racing cycle was full of unprecedented and unpredictable events. A hurricane swept in the week before the NYC Marathon and wreaked havoc on the five boroughs. The race was on! The race was off! Never before had the New York City Marathon been canceled. Yet it was. So, I quickly searched for another racing opportunity and found my chance in Pensacola, Florida. There’s so much good and so much heartbreak wrapped up in this race. Yet, I can’t say there are regrets. Disappointment, sure. Growth, yes. It’s hard to lament an experience that while denying me one thing, generously bestowed much more. I spent months visualizing a race in which there’d be 45,o00 runners and millions of spectators. That energy, I’d hoped, would help me to the finish. 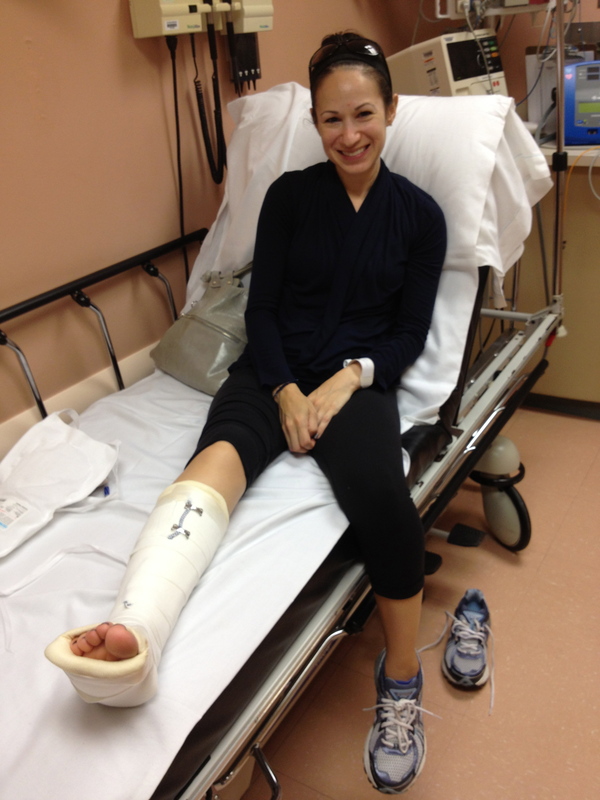 I looked forward to seeing friends and family along the New York City Marathon course. 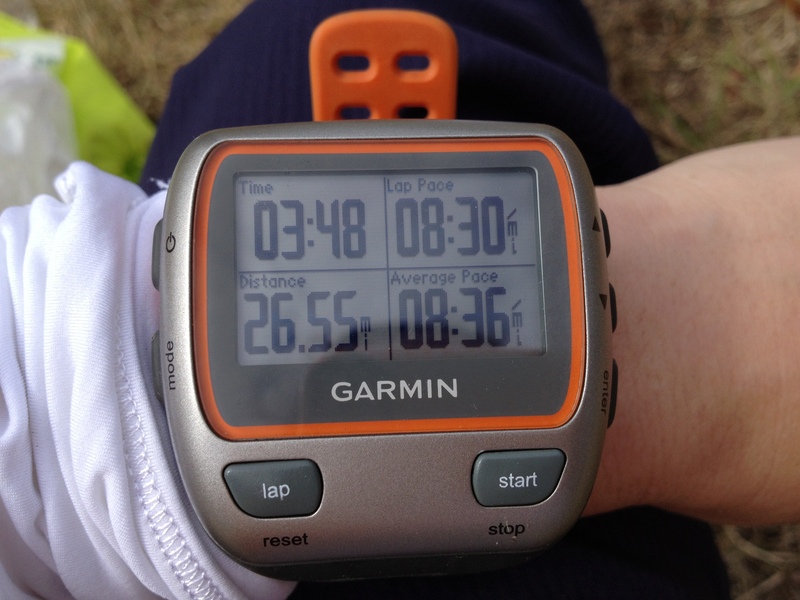 Jess and I planned to pace each other to a 3:35 finish. After the cancelation, I decided to try a different direction. 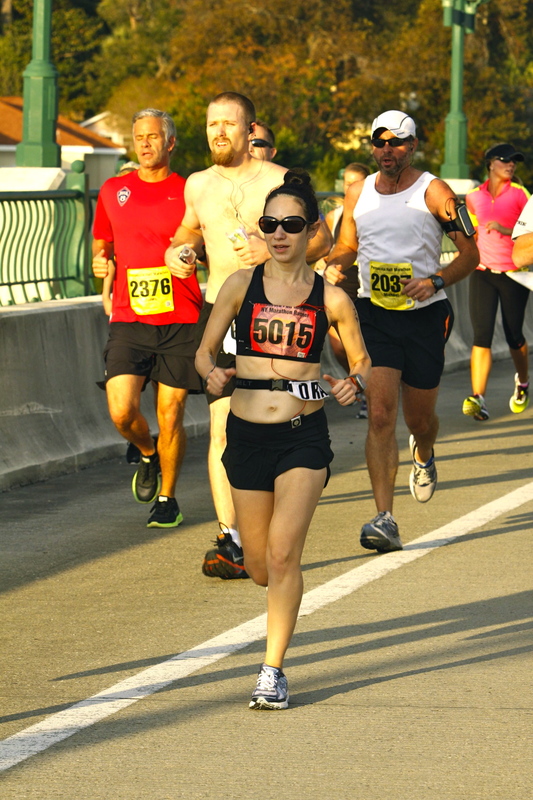 The Pensacola Marathon, with its 535 finishers, would be the perfect environment for self-focus on the course. It would provide a chance to rely solely on myself to get through the race. I could have space to regroup, settle in, and push for my Boston Qualifying goal. It was wonderful to see how graciously the Pensacola race organizers welcomed displaced New York City Marathoners. They expanded the race field and discounted our entry fees. 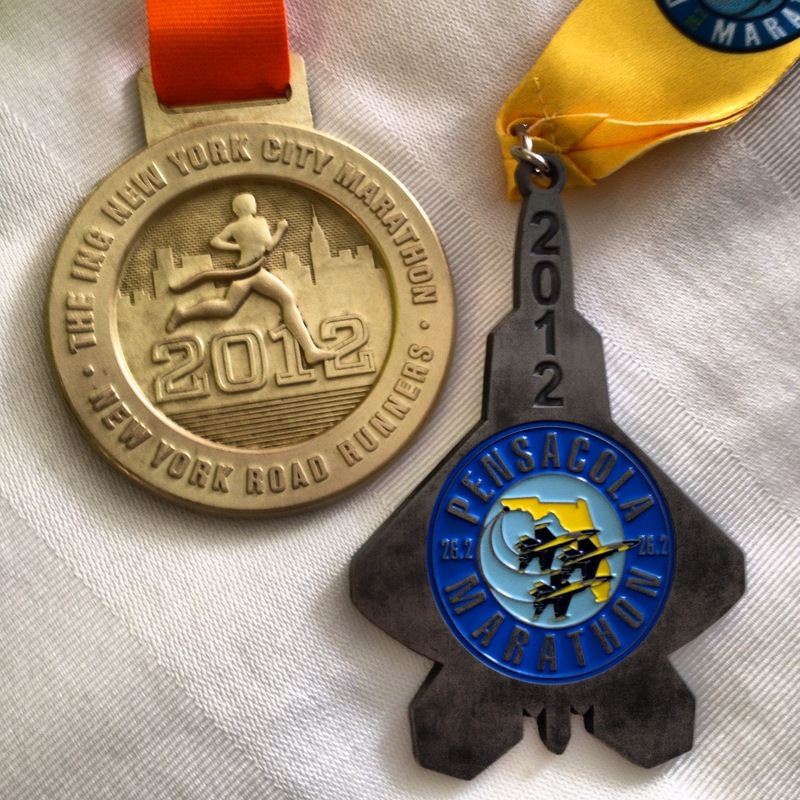 We received special red bibs (full runners had white; half runners had yellow) that said “New York Marathoner” on them. With my race bib in hand, I was set to prepare for race day. Marathon morning was beautiful. I awoke well-rested and calm. The temperature was in the low 60s, with the sun just rising and a cool breeze from the water. There were no race-related nerves: it was simply time to execute the last 26.2 miles. I stood quietly picturing what was to unfold. I had no doubt about my ability – this is what I trained for. With 17 weeks of training behind me, and my 3:35 pace tattoo, I was ready. 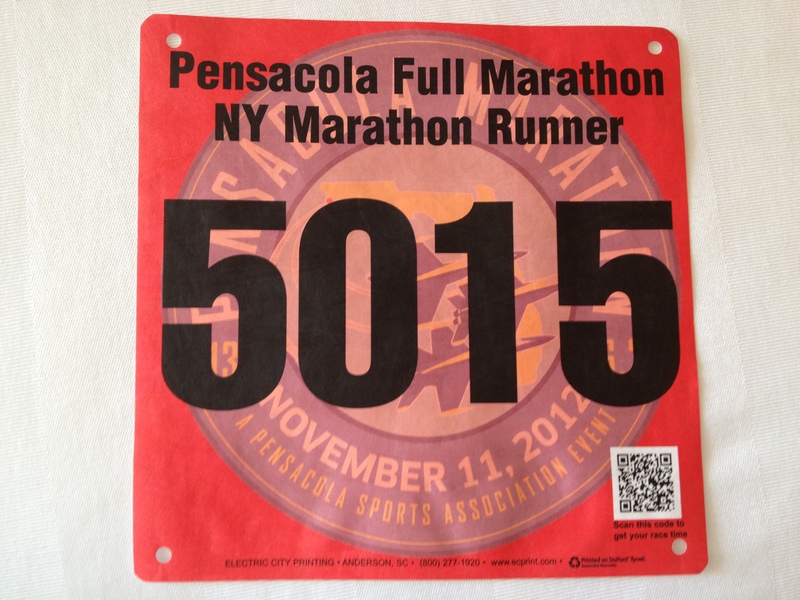 Due to its size, the Pensacola Marathon had no start corrals. I tucked myself in behind the front runners knowing I’d get room to ease into my pace from the beginning. My biggest challenges would be to not get lured in by the half marathoners’ paces, and to not go out too fast. I couldn’t have been happier with how I started the race. My first mile was about 10 seconds slower than my goal pace of 8:12 minutes/mile. After, I consistently began hitting a range between 8:04-8:10 minutes/mile. As I chatted with runners along the course, I was confident and in control of my run. I was having a great time enjoying the few enthusiastic spectators who cheered us on. After the turmoil surrounding the New York City Marathon, I felt grateful to finally be running. The course itself was a bit cumbersome with many turns to navigate around the neighborhood. The scenic start along the water veered in around 4.5 miles to less beautiful views. We wove through residential sections and industrial buildings. We passed an airport twice on a serpentine road that made hell for cutting tangents. For the first half, the course was completely closed. Around mile 15, we came out onto a partially closed course, running mostly in a wide shoulder. However, the police did a fantastic job of giving runners priority over vehicles. At mile 15 I finally refueled (thanks to Generation UCAN) and tossed my Spibelt. I was running unburdened, still barreling along at pace. I began mentally preparing for an upcoming incline around mile 17 – a small bridge a bit steeper than Cat Hill. I took that on without much problem and completely forgot another incline followed about a mile later. That one seemed to slow me down more. Around mile 20 is when something happened. There wasn’t one defining moment – no twisted footfall, no landing on debris – but my right foot began to hurt. I kept pacing, trying to assess the situation. The foot pain increased the more I ran and this is when the race began to unravel. Still running, I slowed down, hoping my earlier pace would sufficiently buffer the last miles. At that time, a sub-3:40 finish was still within reach. That was the case for the next few miles. But the pain kept increasing, and I knew something was seriously wrong. A quick walk break provided a little relief, but the pain intensified each time I began running. I finished the final 4 miles by run-walking and trying to manage the discomfort. Both 3:35 and 3:40 slipped away. I ran across the finish line and gathered my medal. It was emotionally difficult to start the race feeling strong and finish it feeling broken. The medics at the finish line were amazing people. They took great care of me and gave me the names of local facilities to be x-rayed. An urgent care facility confirmed a stress fracture on my right 5th metatarsal. I left wearing a splint and on crutches. I can’t say I’d ever imagined this conclusion. But running marathons is no easy business. Unfortunately, injury has its role to play. Just seems this happened to be my time to have that experience. After the chaos leading up to the Pensacola Marathon, the dramatic ending somehow seems befitting the whole ordeal. Now that some days have passed, I can attest that more good came from this experience than disappointment. I’ll have another go at my Boston Qualifier as soon as I’m properly healed. This race proved the ability and physical conditioning are there as long as my body cooperates. When it mattered, I sought my own path and gave myself a second chance. I’ve learned I’m fiercely protective of my goals and I’m even more protective of the longevity of my running career. I look forward to giving my body a chance to strengthen and heal. For I truly believe in this down time is a moment to learn something about myself. 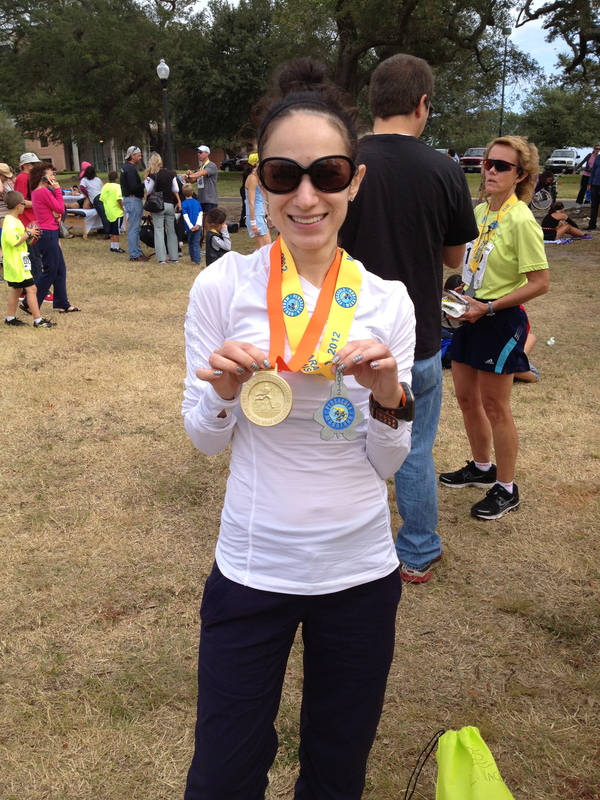 A hurricane, a canceled race, a destination marathon, and injury couldn’t stop me from trying my hardest. I’m already looking toward spring. Then, that BQ goal will be mine! ← Race To Recover: Thank You! im sorry to hear about your injury! 😦 How did you get the 2012 medal though!? Oh, thanks – was healed in time to train for a spring marathon, so all worked out well enough 🙂 Entrants were allowed to pick the medal up at NYRR headquarters after the race’s cancellation. page on a regular basis, this site is really good and the users are genuinely sharing nice thoughts. That the demon limelight of celebrity ostensibly didn’t kill this one — that the flame merely died out on its own — makes it almost sadder.